There is a challenge going around lately I’ve seen on a few blogs; remake one of your earliest cards. This isn’t exactly one of my earliest cards (are you kidding, those are embarrassing!) but I wanted to show it here and I wasn’t sure I had kept a photograph because I made these when Spencer was a newborn. I looked for it and I did have the presence of mind, even with a tiny baby, to take a photo. YEAH! But when I saw it, I was vaguely disappointed. I remember thinking it was one of the best cards I’d ever made and at the time, it could have been up there. So rather than just post the original card, I decided to remake it and show both! The reason I wanted to show this card was the nifty opening. I figured I would need a lot of thank you cards, in fact I think I might have started then before he was born. OK, I realize that could seem presumptuous but every new mom gets gifts for the baby right? Anyway, I wanted a layered look but didn’t want to use up my entire stash of paper. So I came up with a neat way to have my cake and eat it too! This card is not folded, the banana layer is just a 4.25×5.5″. the celery panel is held in place only with the brad in the upper corner and the semi-circle made with the slit punch at the bottom. The celery layer swings up and out of the way to read the message underneath! This uses a lot less paper than making full cards and I think it is pretty interesting was well. I just hope everyone figured it out and didn’t think my hormones got the best of me and I was sending out cards with no message! Sorry about the smudge in the upper right corner. In retrospect, I think I like the larger font better. I think the giraffe is a bit dark but I am still learning my Copic markers. I am not used to the paper I am using either. The white streak down the front of the giraffe is my attempt at a highlight with the blender pen. On SU! paper I am used to, I might get little to no ink movement with the tiny amount of blender I applied. 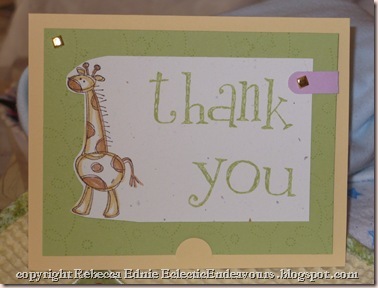 With the Neenah cardstock I was using, well, you see the results and I went very lightly! 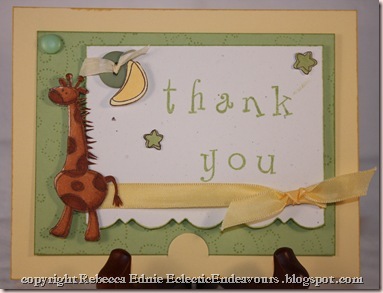 If I was going to make this again, I would also use a background stamp on the yellow layer. Maybe some subtle lines. I would really like to have used a Cuttlebug folder but they don’t quite fill a whole 4.25×5.5″ piece of paper and I didn’t want to re-cut my yellow layer. Accessories: silver brad, markers, slit punch All products SU! Accessories: brad-UK, button-SU!, Copic markers, silk ribbon-UK, banana SU! marker (dyeing ribbon), celery SU! marker(edging), MS cornice punch, taffeta ribbon-SU! Next postRomance Isn’t Dead! Hubby Made Me A Card!